The government of Texas operates under the Constitution of Texas and consists of a unitary democratic state government operating under a presidential system that uses the Dillon Rule, as well as governments at the county and municipal levels. Austin is the capital of Texas. The State Capitol resembles the United States Capitol in Washington, D.C., but is faced in Texas pink granite and is topped by a statue of the "Goddess of Liberty" holding aloft a five-point Texas star. The capitol is also notable for purposely being built seven feet taller than the U.S. national capitol. The executive branch consists of the Governor, Lieutenant Governor, Comptroller of Public Accounts, Land Commissioner, Attorney General, Agriculture Commissioner, the three-member Texas Railroad Commission, the State Board of Education, and the Secretary of State. Texas has a plural executive branch system which limits the power of the Governor. Except for the Secretary of State, all executive officers are elected independently making them directly answerable to the public, not the Governor. Partly because of many elected officials, the governor's powers are quite limited in comparison to other state governors or the U.S. President. In popular lore and belief the lieutenant governor, who heads the Senate and appoints its committees, has more power than the governor. The governor commands the state militia and can veto bills passed by the Legislature and call special sessions of the Legislature (this power is exclusive to the governor and can be exercised as often as desired). The governor also appoints members of various executive boards and fills judicial vacancies between elections. All members of the executive branch are elected statewide except for the Secretary of State (appointed) and the State Board of Education (each of its 15 members are elected from single-member districts). The executive branch also includes several boards and commissions that are constituted through a mixture of elections and gubernatorial appointments confirmed by the Senate. Even with the Governor appointing several members of boards and commissions, the overall effect is a sprawling network of administrative bodies that neither the Governor nor the Legislature are able to coordinate or completely control. The Governor appoints the directors of a handful of state agencies, and the Governor exercises direct authority over these offices. Most state agencies are headquartered in Austin. The Texas Administrative Code contains the compiled and indexed regulations of Texas state agencies and is published yearly by the Secretary of State. The Texas Register contains proposed rules, notices, executive orders, and other information of general use to the public and is published weekly by the Secretary of State. The Texas Legislature is bicameral. The Texas House of Representatives has 150 members, while the Texas Senate has 31. The Speaker of the House presides over the House, and the Lieutenant Governor presides over the Senate. It is a powerful arm of the Texas government not only because of its power of the purse to control and direct the activities of state government and the strong constitutional connections between it and the Lieutenant Governor, but also due to Texas's plural executive. The legislature convenes its regular sessions at noon on the second Tuesday in January of odd-numbered years. The maximum duration of a regular session is 140 days. The Governor is given authority under the state constitution to convene the legislature at other times during the biennium. Such sessions are known as called or special sessions and are reserved for legislation that the Governor deems critically important in the conduct of state affairs. Called sessions are limited to a period of 30 days, during which the legislature is permitted to pass laws only on subjects submitted by the governor in calling for the session. Unlike other states, only the Governor may call the Legislature into special sessions (and may do so as often as desired); the Legislature lacks the power to call itself into special session. Its session laws are published in the official General and Special Laws; most, but not all, of these statutes are codified in the Revised Civil Statutes, Penal Code, and Code of Criminal Procedure (sometimes referred to as the Texas Statutes). The judicial system of Texas has a reputation as one of the most complex in the United States, with many layers and many overlapping jurisdictions. Texas has two courts of last resort: the Texas Supreme Court, which hears civil cases, and the Texas Court of Criminal Appeals. Except in the case of some municipal benches, partisan elections choose all of the judges at all levels of the judiciary; the governor fills vacancies by appointment. All members of the Texas Supreme Court and the Texas Court of Criminal Appeals are elected statewide. The Municipal Courts are the most active courts, with the County and District Courts handling most other cases and often sharing the same buildings. Administration is the responsibility of the Supreme Court, which is aided by the Texas Office of Court Administration, the Texas Judicial Council and the State Bar of Texas (the Texas Bar). Each county is run by a five-member Commissioners' Court consisting of four commissioners elected from single-member districts (called commissioner precincts) and a county judge elected at-large. The county judge does not have authority to veto a decision of the commissioners court; the judge votes along with the commissioners (being the tie-breaker in close calls). In smaller counties, the county judge actually does perform judicial duties, but in larger counties the judge's role is limited to serving on the commissioners court and certifying elections. Certain officials, such as the sheriff and tax collector, are elected separately by the voters, but the commissioners court determines their office budgets, and sets overall county policy. All county elections are partisan. The Commissioners Courts in Texas are served and provided continued education by the County Judges and Commissioners Association events and the official association publication County Progress. 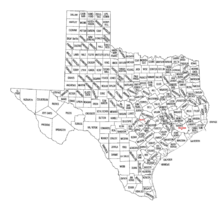 Counties in Texas have limited regulatory (ordinance) authority. Counties in Texas do not have zoning power (except for limited instances). However, counties can collect a small portion of property tax and spend it to provide residents with needed services or to employ the power of eminent domain. Unlike other states, Texas does not allow for consolidated city-county governments. Cities and counties (as well as other political entities) are permitted to enter "interlocal agreements" to share services (for instance, a city and a school district may enter into agreements with the county whereby the county bills for and collects property taxes for the city and school district). Cities are classified as either "general law" or "home rule". A city may elect home rule status (i.e., draft an independent city charter) once it exceeds 5,000 population and the voters agree to home rule. Otherwise, it is classified as general law and has very limited powers. Larger cities (those exceeding 225,000) have a unique authority: that of "limited annexation", whereby an adjoining area may be annexed for purposes of imposing city ordinances related to safety and building codes. The residents can vote for mayor and council races but cannot vote in bond elections (and, consequently, the city cannot directly collect city sales tax from businesses or city property tax from owners). Municipal elections in Texas are nonpartisan in the sense that candidates do not appear on the ballot on party lines, and do not run as party tickets. However, a candidate's party affiliation is usually known or can be discerned with minimal effort (as the candidate most likely has supported other candidates on partisan tickets). In addition to cities and counties, Texas has numerous special districts. As with municipal elections in Texas, board members or trustees are elected on a nonpartisan basis or may be appointed. The most common is the independent school district, which (with one exception) has a board of trustees that is independent of any other governing authority. School district boundaries are not generally aligned with city or county boundaries; it is common for a school district to cover one or more counties or for a large city to be served by several school districts. The Texas Education Agency governs public education in Texas. Other special districts include Groundwater Conservation Districts (regulatory agencies), river authorities, water supply districts (for irrigation or municipal supply), public hospitals, road districts and community colleges. ^ Rathjen, Frederick (April 1957). "The Texas State House". Southwestern Historical Quarterly. American Heritage Publishing. LX (4). ^ "The Plural Executive". University of Texas at Austin. 2005. Archived from the original on April 18, 2008. Retrieved 2008-05-07. ^ a b c "The Executive Branch". Texas politics. University of Texas at Austin. Archived from the original on 9 April 2014. Retrieved 4 April 2014. ^ Quarles & Cordon 2003, p. 305. ^ Quarles & Cordon 2003, pp. 302–304. ^ Research Division of the Texas Legislative Council. Guide to Texas Legislative Information (PDF). Texas Legislative Council. p. 9. OCLC 36222302. Archived (PDF) from the original on 2013-11-18. ^ State of Texas v. West Publishing Company , 882 F.2d 171 (5th Cir. 1989). ^ Texas State Law Library. "Historical Texas Statutes". Archived from the original on 14 December 2015. Retrieved 3 January 2016. ^ Kraemer, Richard (2009). "Texas Politics, 10th edition". chapter 2, page 48. HEINLE Cengage. ^ County Judges and Commissioners Association. Archived from the original on 2017-08-12. ^ Texas County Progress Magazine. Archived from the original on 2017-07-09.